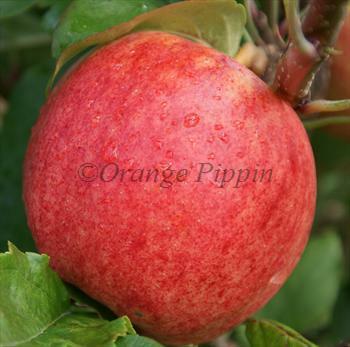 Red Falstaff is one of the best garden apple varieties for the UK. For a start, the flavour is extremely good - you will never have problems giving away a surplus of these apples. And you almost certainly will have a surplus because Falstaff is also one of the heaviest-cropping of all apple varieties - fortunately the apples keep fairly well, they will last in a fridge until Christmas. It is also easy to grow and generally disease-free, and grows in a neat and tidy fashion. Red Falstaff is an excellent crunchy juicy apple, with light cream-coloured flesh and an orange / red flushed skin. The flavour is a well-balanced combination of sweetness and acidity, and exactly what you expect an apple to taste like. Red Falstaff is a sport (natural genetic mutation) of Falstaff, which is a cross between James Grieve and Golden Delicious. We tend to find that the James Grieve parentage probably has the greater impact on Falstaff's flavour, and it is pleasingly sharp when eaten straight from the tree. The relation to Golden Delicious is much less apparent in the colour or flavour, but is reflected in the very heavy crops which Falstaff can produce, as well as the appealing crunchiness of the apples. Falstaff also inherits some of the keeping qualities of Golden Delicious - it certainly keeps better than James Grieve, and if kept well-chilled will retain the flavour and crispness for several months. Like many apple varieties where James Grieve is one of the parents, Falstaff is very juicy and is a great apple for home-juicing. Red Falstaff® is a protected variety. Please fill in the details below and we will let you know when Red Falstaff apple trees are back in stock. Related to Falstaff, similar flavour, slightly better disease resistance. A pretty red apple with a good flavour. Red Falstaff is in flowering group 3. Red Falstaff is self-fertile and does not need a pollination partner, although fruiting may be improved if there is a compatible tree of a different variety nearby. Since it flowers in the middle of the blossom season it can be pollinated by most other apple trees. From the horticultural perspective Falstaff inherits the best characteristics of its parents. It crops very heavily, and is generally easy to grow, and not too bothered by diseases. However it tends to do better in drier areas than wetter areas. Whilst its main attributes are of course its fruiting capacity, it is worth noting that Falstaff generally grows into an attractive and fairly symmetrical tree. Please note, if you are planning to train a 1-year bare-root Red Falstaff tree as a fan or espalier, the tree supplied will almost certainly be a "feathered maiden", not a "maiden whip". Red Falstaff is one of a number of varieties (Cox is another) which has a strong tendency to produce feathers (side shoots) in its first year of growth. This should be an advantage for fan or espalier training as it gives you a bit of a headstart, but does mean you will probably need to use some of these existing lower shoots rather than cutting back to a bud as is usually suggested in gardening books. Falstaff is a late 20th century cross of James Grieve and Golden Delicious, developed at the famous East Malling Research Station in Kent, England.